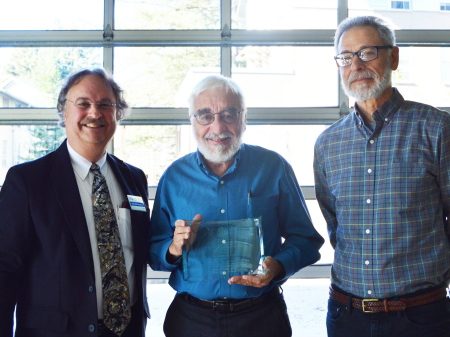 Chancellor Blumenthal (right) presented David Kaun (middle), a professor emeritus in the Economics Department, with the division's Distinguished Social Sciences Emeriti Award. Dean Kamieniecki is pictured left. 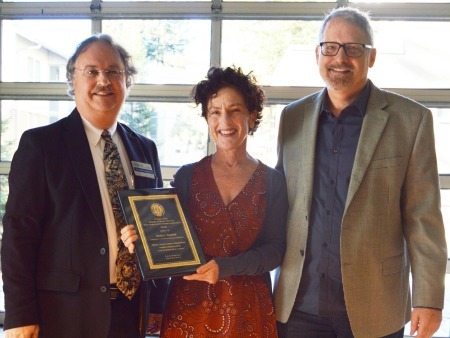 Environmental studies professor Andrew Szasz was presented with the Martin M. Chemers Award for Outstanding Research, named for the retired professor and former interim chancellor. Economics professor Dan Friedman (right) presented him with the award. 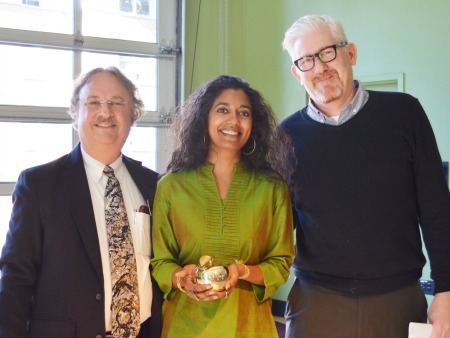 Politics professor Kent Eaton (right) presented Mayanthi Fernando with the Golden Apple Teaching Award. Abbey Asher from Colleges 9 & 10 was recognized for her wide-reaching efforts as services-learning coordinator with the Staff Outstanding Achievement Award. Psychology professor and department chair Cam Leaper (right) presented her with the award. Social sciences is central to how we relate as human beings, remarked Chancellor Blumenthal at the Division of Social Sciences annual fall breakfast held October 6. Approximately 150 staff and faculty attended to see the annual teaching awards ceremony and hear remarks by Chancellor Blumenthal and Social Sciences Dean Sheldon Kamieniecki. Students are drawn into the division for its commitment to social justice, equity, and environmental protection, Chancellor Blumenthal added. 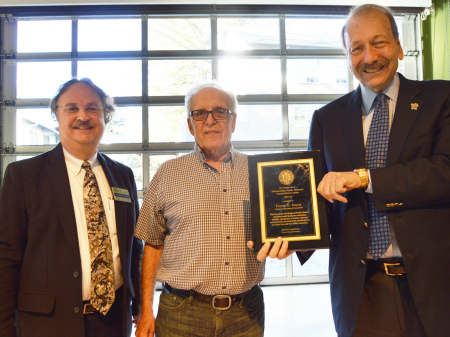 Chancellor Blumenthal presented David Kaun, a professor emeritus in the Economics Department, with the division's Distinguished Social Sciences Emeriti Award. The award honors eminent social sciences scholars who continue to make major contributions in their field as emeriti faculty. Kaun’s distinguished career at UC Santa Cruz includes serving as provost of Stevenson College for many years and encouraging a campus-wide commitment to philanthropy. Most recently, Kaun launched a matching gift challenge for the Gabriel Zimmerman Memorial Scholarship that supports undergraduate students dedicated to public service and social justice. The scholarship was established in honor of Gabriel Zimmerman who was tragically killed while working as an aide for Arizona Congresswoman Gabrielle Giffords. To mark the five-year anniversary of Zimmerman’s passing in January, Kaun challenged his colleagues with a matching gift for every new or increased faculty or staff donation to the fund. His outreach helped increase the fund from $65,000 to its current market value of more than $150,000. In addition, Kaun established an endowment for the Milam-McGinty-Kaun Award, which annually awards $1,000 to two graduate students in the social sciences. He is committed to giving back to the university so that students can access a stellar educational experience and faculty are supported in their research and teaching endeavors. Environmental studies professor Andrew Szasz was presented with the Martin M. Chemers Award for Outstanding Research, named for the retired professor and former interim chancellor. Anthropology professor Mayanthi Fernando was named winner of Golden Apple Distinguished Teaching Award in the Social Sciences Division for 2016. Winner of the Staff Outstanding Achievement Award was Abbey Asher, the services-learning coordinator for College Nine and College Ten.